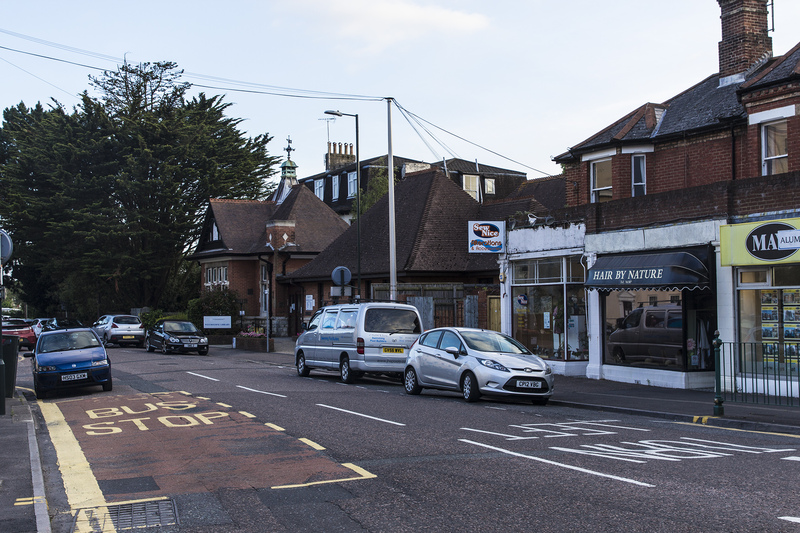 Partway round the Seamoor Road loop, Alum Chine Road starts its somewhat tortuous route. At the northern end, it is fairly straight. There are some shops and businesses either side, including the library. Westbourne Library has just celebrated its 100th anniversary, and will be the subject of a separate article later. As we head south, we pass a fairly large building which houses an accountancy business and a dentist. Behind this is the very imposing Bournemouth Self Storage warehouse. Formerly a warehouse building, known as the Pantechnicon, this is a Grade II listed structure. Next to this is a former Doctor’s Surgery, now a private residence. This largely sets the scene for the rest of the road, at least to the junction with West Cliff Road. There are numerous large properties – some now divided into flats, one a rest home, others have had properties built in their formerly substantial gardens. Things change when we reach West Cliff Road. Here, Alum Chine Road eases off to the right. However, the road markings are such that now the precedence is for other traffic over that heading from the north, giving rise to a somewhat awkward junction. It is apparent that the western direction that West Cliff Road takes is a more modern addition. On the junction there are three hotels. The Roselyn to the left, which is currently being refurbished. Opposite, there is the Cleveland and, to our right, the Southernhay. Heading west now, but still continuing along Alum Chine Road, on our left is a building called “Denewood”. This was at one point “Denewood Court”, which advertised itself as a “Board Residence – Select and Comfortable”. It would appear that further back this was more along the lines of a manor house, with substantial grounds of its own. The adjacent cul-de-sac Denewood Road is no doubt built in the former grounds. Alum Chine Road has taken on a new nature now, twisting and turning quite severely. There is a consulting rooms and another hotel before we get to the roundabout where this road ends. Alumhurst Road, which has taken a much more direct route from Westbourne, crosses over here, and it is this road that actually goes down to the Chine itself. To our left, is the landmark building of the Westbourne Academy School of English, but this is actually in Alumhurst Road, which I shall cover another time.